New Zealand and Fiji will meet in the OFC Women's Nations Cup final. 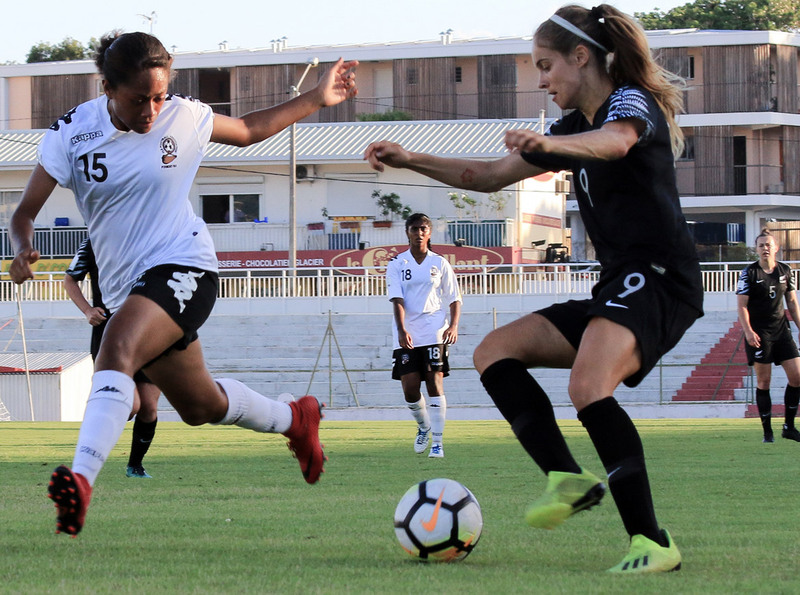 When Fiji and New Zealand met in the final match of Group B at the OFC Women’s Nations Cup there were few who could have predicted that one match later they’d be facing off for the second time in a week. But as both teams prepare for the rematch at Stade Numa Daly tomorrow, they do so knowing that the stakes are much higher on this occasion. New Zealand may have eased past the Group B runners-up with a 10-0 victory, the third of which they won by double-digits, however Fiji rested a number of key players ahead of the semi-finals knowing they’d need the reinforcements to take on Papua New Guinea. Having seen of the two-time finalists in a spirited performance from both sides, Fiji are concentrating on the final objective – an historic first-time appearance at the FIFA Women’s World Cup. Coach Marika Rodu said the team are well aware of what is on the line, and also what they will face on the field tomorrow. “We will take the game seriously. We won’t go there just to play, but we’ll be going there to win,” Rodu stated. Over the course of the group games Rodu kept a close eye on New Zealand, knowing he’d meet the side in the final group game. Fortunately, the side had done enough in their opening two matches to know they weren’t relying on the results of the last match to progress meaning the coach could rest several of his key players ahead of what would be a tough semi-final against Papua New Guinea. “It’s going to be a different match this time,” he said. Although Rodu admits the side has already exceeded expectations for this event, but he still wants to see them competing come kick-off. “Now it’s a rematch, but for us it’s not only a rematch but revenge,” Rodu said. Playing under the New Caledonia sun has helped New Zealand break a sweat, but the side hasn’t really struggled too much so far in the competition. The hot favourites to book a fourth-consecutive FIFA Women’s World Cup ticket, Tom Sermanni’s side have shown why they continue to reign in Oceania with clinical, organised performances which speak to the time and effort which has gone into women’s football development in New Zealand over the past 10-15 years. But they are by no means taking tomorrow’s final as a done-deal. “I think obviously they rested a lot of players for the semi-finals and with the result from Wednesday that’s obviously paid dividends,” Sermanni said of taking on Fiji for a second time in the competition. “The game in the weekend is going to be a lot tougher than the game we had against them in the last group match so we have to go away now, make sure everyone is fit and healthy, have a look at the Fiji game from Wednesday and work out our tactics for the weekend. “They’re a team that’s very well organised, they’ve been well coached, they’re a team that combines well together and look like they’ve worked together a long time. Forgetting about their opponent for a moment and focusing on his squad, Sermanni said what has pleased him the most so far has been the approach to each and every game. “The players have gone about the job in a very professional manner, and I think due to that we’ve been able to manage the playing time as best we can and the team is therefore quite refreshed and ready to go tomorrow. While the main focus of the action tomorrow will be on the final and seeing who qualifies not only for the FIFA Women’s World Cup France 2018, but also for the Olympic Women’s Football Tournament, there is also the small matter of the final spot on the podium to take care of. Papua New Guinea will meet the hosts New Caledonia, also for the second time in the competition, with both playing for the pride of a third-place finish. Papua New Guinea started well against Fiji in their semi-final encounter on Mare, but the conditions of the tournament seemed to finally catch up with the team which has been travelling since early November. Despite starting reasonably well against Fiji, taking the lead through Meagen Gunemba, once Fiji equalised Papua New Guinea slowly started fading away allowing their opponent to get the better of them. “We’ll be ready for that one but the girls they really dropped after the semi-final. If we can secure third place it will be great, but we will give our best regardless,” coach Peter Gunemba said. For the hosts, having gone down 6-2 in Group A to their upcoming opponents before losing the semi-final 8-0 to New Zealand, they’re ready to ensure they can achieve something they’ve never done before – a top three finish in the OFC Women’s Nations Cup. “It will be a good chance for revenge for us,” New Caledonia coach Kamali Fitialeata said. “I have some small things to look at, to put in place, but I don’t think I’ll have to say much to the girls because they’ll be motivated enough on their own to try and achieve a positive result from this match.